Anne Louise Carney escaped from Canada's cold winter to join us at the center to work in our garden and with local women in the community. One of the groups she worked with was the Las Morphas women’s group that meets at the center twice a week to work on their crafts and to speak about the community. They along with other artisans sell their products in our gallery at the Center. 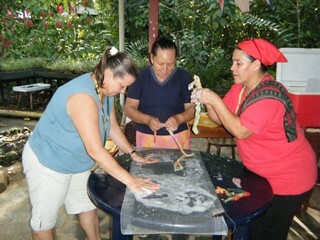 Anne used her expertise in felting to teach Las Morphas and all interested community women how to make frogs, monkeys, birds, butterflies, and other rainforest animals out of the felting material she donated. They had never used anything like it before, but learned very quickly. This was a great activity because many female artisans generate an income by selling their handmade products in our gallery. Although Anne did not speak any Spanish, the women and her connected on a deep level and spent a lot of time laughing.